“A special goal we have had in the four years that I’ve been here is to make it to Cary, North Carolina, where the Division II World Series is held. That would be my ultimate goal for the team this year, along with just playing the best baseball we can day in and day out,” said Griffins senior pitcher Alex Haines from Greensburg, PA, before the 2014 season had begun. Take us back to early February and one will notice while walking the halls of Seton Hill University (SHU) the flyers and posters containing the numbers ‘484.18’. What may seem like a random set of numbers, instead, held distinct meaning representing the distance in miles from Greensburg, PA to the National College Athletic Association (NCAA) Division II World Series location in Cary, NC. Call it a mission or a journey, either way it required a standard of excellence for the Griffins to play up. The Griffins finished with a 41-17 overall record, going 36-14 in their first regular season in the Pennsylvania State Athletic Conference (PSAC), undefeated in the NCAA Division II Atlantic Regional, and earning their first ever appearance in the NCAA DII World Series, it is safe to say that the Griffins simply played ball this year. Reaching the World Series in Cary, NC, was the ultimate goal for the Griffins before the season had begun and indeed they did just that. After winning the first opening game 4-2 in the World Series against the Minnesota State University – Mankato Mavericks brought in hope that maybe, just maybe the Griffins were going to expand on the pre-season goal and bring back that national championship trophy. After losing to Colorado Mesa in the next round, SHU faced a win or go home game against previous beaten Mavericks, unfortunately this time around did not have the same result. The Griffins lost their chance of advancing to the semifinals and ultimately were eliminated from the World Series in a 3-1 loss. Despite the tough loss, the Griffins still were left with a positive outlook on their season. With such great support from their fans consisting of alumni, faculty, students, and family members and friends, the Griffins were not ashamed of their performance at Cary. 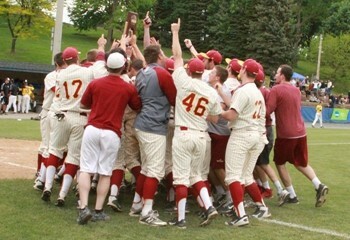 Seton Hill Baseball even tweeted after losing the game, “Leaving Cary the same way we arrived- with PRIDE” @SHGriffBaseball. The Griffins baseball team graduates six key seniors this year, but welcomes and returns young talent as well key veteran players to balance out the roster. Including junior infielders/batters Cody Herald from Butler, PA, and Nick Sell from Wexford, PA that specially showcased their talents in the postseason. “We know what ingredients are necessary in order to compete with elite teams in the country,” said head coach Marc Marizzaldi who improves his overall record to an impressive 377-211. The residents of the Greensburg community should feel honored to have such a successful baseball team that keeps SHU recognized on the map nationwide. As for the Griffins baseball team, they will have to wait until 2015 for the next season to begin, but for now I am sure a relaxing summer is needed to restore dreams of reaching Cary again in the future.